Age Range: 1 to 6 years. Class Structure: ‘Themed’ monthly (non-sequential) units per level. 1) Have one of our experienced and licensed educators come and teach the program in your centre. 2) Receive training and have your own staff teach in your centre with the help of our guided CDs and classroom kits. North Brisbane region, to discover more. 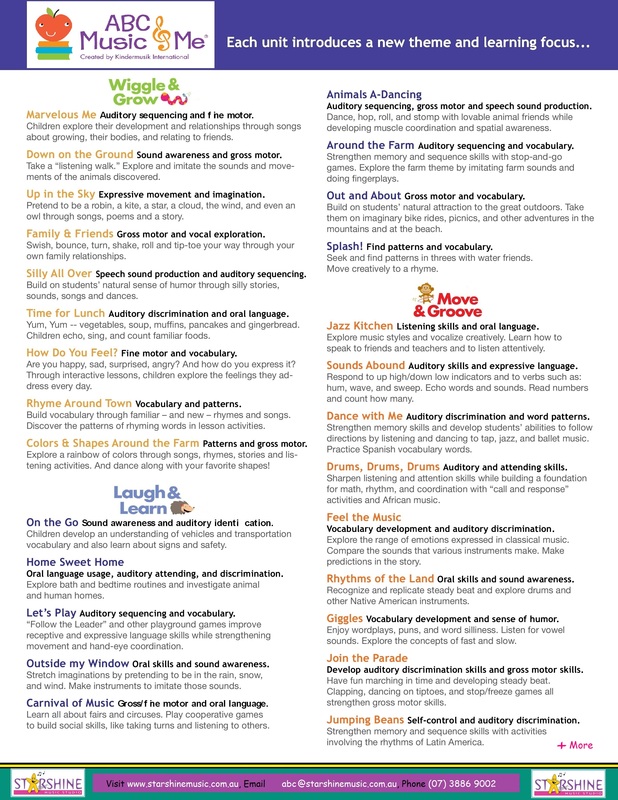 ‘ABC Music & Me’ is an award-winning Early Childhood Music and Movement program for 1 to 6 year olds, created by ‘Kindermusik International’, the world’s most trusted brand in musical learning and research for over 35 years (see HERE). It has been specifically designed for Schools (Prep), Child Care, Kindergarten, Preschool, Family Day Care, and Early Years Learning Centres, and is a research-based (and research-proven!) Early Childhood Curriculum helping to develop pre-literacy and language, maths, and social-emotional skills through a child’s most loved rituals: music and story-time. In 2013, this program was approved by the Department of Education, Training and Employment (QLD) as a ‘One School Supplier’. Improve early language development, pre-literacy, and word recognition. Strengthen fine-motor, gross-motor, and locomotor skills. Cultivate sharing, self-regulation, and self-control. 3. Children have a strong sense of well-being. Instrument Exploration and Ensemble Skill Development – Your child will explore the physical characteristics and sounds of age-appropriate instruments which will eventually lead them to discover their potential for beat, rhythm, and melodic ensemble playing. Learning to play instruments in time with music improves hand-eye coordination, and strengthens their fine motor skills. Songs & Rhymes – Songs and rhymes develop phonetic awareness and early reading skills. Developmentally-appropriate songs help to develop vocal chords and expressive speech. From the first “Hello” song to the last “Goodbye,” exploring a variety of musical styles and genres leads children to find their own voice. Singing helps with memory and recall, physical development, creativity, and socialisation. Assorted Movement – Whether moving as a class, or as individuals, Kindermusik movement activities enhance co-ordination skills; create opportunities for imitation, exploration, and expression; and give everyone something to smile, rock, bounce, or dance about. Story-Time and Early Literacy – Reading aloud to children stimulates their curiosity, expands their knowledge, and broadens their understanding of language. Focused listening with music helps to improve skills in following directions. Musical Concepts – Fun engaging activities bring out the musicality in everyone, and allow children to learn more about music as they learn more about each other. Together Time – Kindermusik is the essence of quality time, allowing you to make the most of the fleeting toddler years and giving you the time and the tools to make music and memories together in class and at home. Learning together helps to emphasise storytelling, imaginative play, and taking turns. Basic AUSLAN (Australian Sign Language) – A great way to try and assist babies in communicating before they’re able to actually ‘verbalise’ the words, and to enhance a toddler’s communication skills. Expert Advice – Our Kindermusik educators explain how our musically based activities enhance your child’s complete development. Learning Continues at Home – With the NEW ‘Digital Home Materials’, the learning continues wherever they go, with your child’s best teacher — YOU! Learn over 60 songs, and play over 100 activities together by the semester’s end! CENTRES – download your ‘ABC Music & Me’ Info Pack HERE. 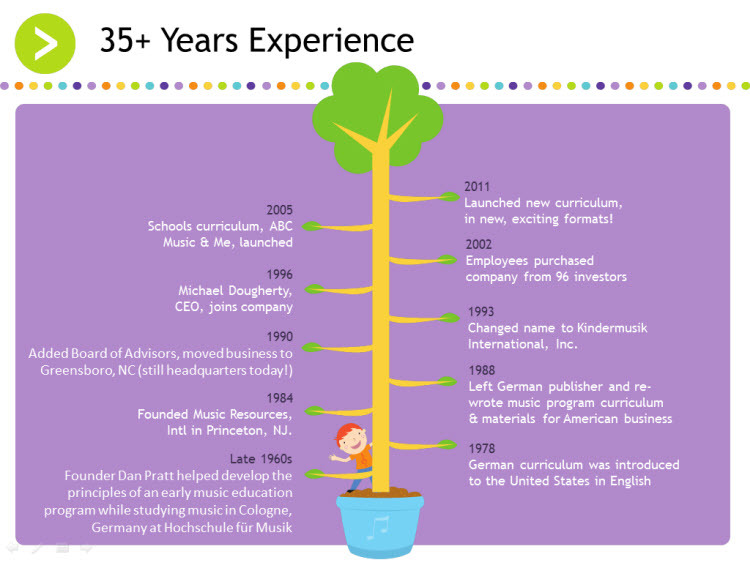 We look forward to bringing Kindermusik to your classroom soon! PARENTS – download your ‘ABC Music & Me’ Info Pack HERE. 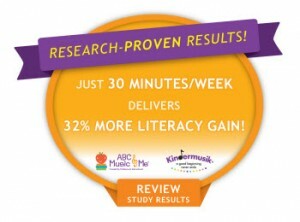 We look forward to sharing the endless benefits that Kindermusik can bring!